Day 9: We again enjoyed the excellent breakfast buffet at the Royal Hotel, checked out (all done by machine!) then took the train through the Kushiro wetlands to Kawayu in the eastern highland region of Hokkaido. Finally, when almost through the wetlands we spotted a wild crane 50m from the train for 5 seconds! But that was enough, we have seen a wild Japanese Crane! Arrived at Kawayu station and asked about the hotel recommended in the Lonely Planet. The station seemed to be in the middle of nowhere, indeed the case. Local bus to the real resort village, passing the volcano Iö-zan with its steaming sulphurous vents, to the real village of Kawayu. There was space in the spa resort hotel Misono Inn which smells slightly of sulphur. Reservation assured we went in search of bike hire. Success at the petrol station, we headed for the volcano, only 10 minutes up the road by bike, though in our case interrupted by an Olive Backed Pipit and various other niceties. The closest either us have been to an active volcano, there are bubbling hot springs and steaming sulphurous vents over a whole hillside. Really rather fine. 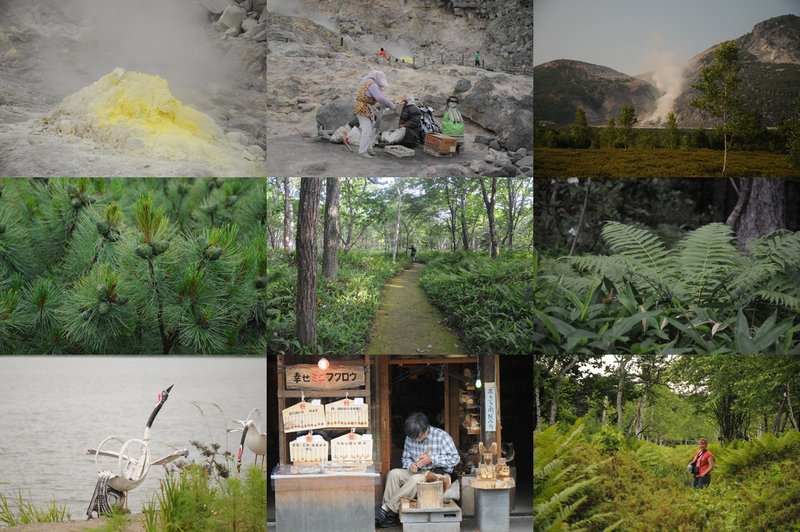 One of the specialties at Japanese fumaroles is eggs boiled in the sulphurous water. And an old couple were indeed placed just below the springs, selling very hot hard-boiled eggs at 100 yen a piece. We bought a bag of two with salt added and enjoyed. We cycled back to the old-fashioned town, checked in at the old-fashioned hotel, the old-fashioned ancient porter took our bags up and showed us to our old-fashioned suite, which has both a Japanese tea room and European style sofa (except that our knees almost reach our chins as we write). Afterwards we cycled to the nearest lake, Lake Kussharo, which is Japan's largest crater lake, Andrea spotted three fox cubs which David missed since he was investigating one of those singing but invisible forest birds, probably a thrush. A pleasant ride, to a rather ordinary and birdless lake with no shore-side path. Mark Brazil's guide to bird watching in Japan recommends a particular walk in the forest. And that one should start at dawn. At 3 am, here. So we decided that it would be wise to try and work out where the path actually started. It is clearly many years since the book was published since the first 500 m was well hidden under 60-70 cm high azalea shrub, which covered the path from both sides. We persevered and entered the forest, where dwarf bamboo and fallen trees provided further obstacles to our progress. Nevertheless, we continued for about 1½ km and we agreed that this was indeed the right path. Out again, we cycled back to the hotel along a fantastic moss-covered path through the forest. In the evening, we had yet another, and very different authentic old-fashioned Japanese experience at the set dinner. We were among the very few few who had not donned kimonos for dinner. Afterward we visited each the appropriate onsen (volcano-fuelled hot spa bath) to see how it worked and strolled down the high street succumbing to a carved would souvenirs.